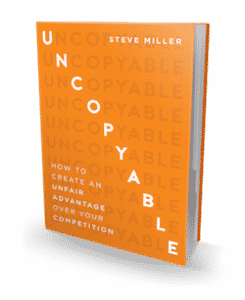 Kay Miller: Uncopyable Sales Superstar! Most of you know who my smokin’ hot wife, Kay, is. And some might even know about how I often refer to her as a “world-class” salesperson. You can be assured that’s not a joke. Kay has the pedigree and the awards to prove it! Watch this week’s UNCOPYABLE Business episode and hear all about her extraordinary success selling in a male-dominated industry. Then get ready for some of the very cool stuff she’s been doing lately! You might be VERY interested to know what she’s up to. Have you signed up for my FREE webinar yet? So proud of you Kay! And it’s so cool that you are having fun with this. Not surprised that you are getting rave reviews! It’s no wonder that Steve is pleased as well. Keep up the good work and hope to see you soon. Great to hear such about your wonderful accomplishments. I love hearing about people who have positive influences on others. Fun eh? A tip of the hat and a raise of my wine glass to you.